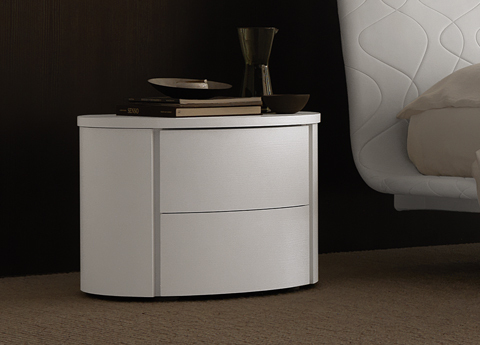 Contemporary bedroom furniture in wood has been making a comeback for the last few years, as ever led by Italian brands like Bimax, Jesse Furniture & SMA Mobili. The trend we have noticed over the last two years or so is that bleached oaks & light oaks are out & white or coloured painted ash & oak are in. The colour of a lacquered ash/oak is a solid colour, but the texture of the wood grain is visible, which can seem a little softer than a normal lacquer, & can look slightly more interesting, especially with the current movement towards more organic, natural finishes. Bedside cabinets & chests of drawers in these finishes are versatile too – they look fantastic with upholstered beds, but could go with wood, lacquer & even metal too. Our new bioethanol fire from Cocoon Fires has now been installed in the showroom & is currently hanging in the window. 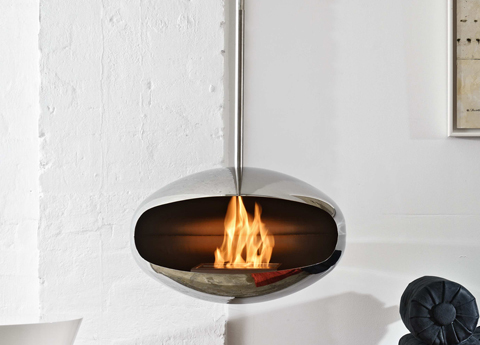 We chose the Aeris fire, in polished steel & I have to say, it looks amazing! We are using bioethanol fires for heating & the Aeris fire sends out a huge amount of heat. Not enough for the whole (3 floor) showroom, but it certainly makes a huge difference. The burner for all three models is the same, so if you would like to see a fire from Cocoon Fires for yourself please do pop by. We can have the tops & sides cut to order, including at an angle & non glass doors can cut as well. We can have the depth reduced, but then none of the fabulous Italian internal accessories fit. You can choose your own internal layout to suit.